Not far from the farmhouse in Northampton, Leo is searching for Raph. He peeks into a storm drain and the echo of the sewer tunnel jogs his memory. He recalls Splinter’s tales of Hamato Yoshi and the Foot Clan and the canister of ooze. He recalls their life in the sewer. He recalls being driven to the surface by the Mousers. He recalls many of his crazy adventures. He recalls finding a new home among the humans. And he recalls being driven from that home by the Shredder, forced to seek refuge in Northampton. Suddenly, Raph sneaks up behind him, snapping him back to reality. Raph has been looking for him for a while and the brothers decide to return to the farmhouse together. As his sons train, Splinter contemplates that a ninja’s training is never complete and wonders if his sons understand this as well. Then, he hears Raph quit in the middle of practice, deciding to go home; sick of repeating the same moves over and over. Splinter intercepts him and berates him for his behavior. Raphael still refuses to return to practice, leaving Splinter no recourse but to teach him a lesson. On the rooftops of New York, Raph is in the middle of a running battle with a unit of Foot Soldiers. He takes down a handful of them, only to notice many more coming his way. Raph heads down to the streets to hide in an alley while he catches his breath. He accidentally alerts Mrs. Morrison, an old blind lady whofinds him outside her door. Mistaking him for the son of a neighbor, she invites him inside to do some chores. Happy to get away from the Foot, Raph enters her home. After finishing the chores, Raph sits down for tea and shoots the breeze with the kindly old lady. Recalling that it’s a school night, Mrs. Morrison sends Raph home, though she invites him back any time. Cheerful, Raph accepts the offer. In Quabbin State Forest, Mass., Mike is busy enjoying the scenery when a pair of bow-toting hunters come along to ruin everything. Despite it being illegal to hunt in a state park, the pair of jerks decide they won’t leave until they’ve bagged a deer. Mike won’t stand for this and decides to have some fun with them while protecting the local fauna in the process. After helping one deer escape, Mike sends one of the hunters fleeing by covering himself in mud and playing “monster”. Mike picks up the hunter’s discarded bow and hurries back to find the remaining sportsman about to shoot down one of the last living mountain lions in Quabbin. Mike fires an arrow, pinning the hunter to a tree by the cuff of his sleeve. Mike then pops out to spook him, causing the hunter to faint. Pleased with his day's work, Mike drops the hunter off at the nearest ranger station. In the barn of the farmhouse, Leo trains like there was no tomorrow. An ominous narrator reminds us of Leo’s serious demeanor: He trains harder than Splinter demands, fortifying himself in both body and in spirit. He takes the role of “leader” and “big brother” almost too seriously, often forgetting that he is still a teenager. Then, Raph storms into the barn with a few choice words for Leo. He wants to know just who signed him up for the Barry Manilow fanclub. Leo, “the serious one”, bursts out laughing. In some weird dimension, Don materializes in a flash of light. He is besieged by giant flying robot manta rays, robot ninja women and various environmental hazards. Don defeats them all, determined to make it to a medieval castle “this time". Jumping over several disappearing pylons, Don is barred by a massive guardian robot. He puts up a good fight, but the robot only plucks him up and flings him into the yawning abyss. Suddenly, Don snaps back into the “real world”. Mike has pulled the plug on his latest computer game; it’s time for dinner. Don declares that he was almost going to make it this time. Mike laughs; Don has finally designed a video game that even he cannot beat. *Leo’s memories ending at their being exiled from New York by the Shredder, and the location being primarily in Northampton, would seem to indicate that “Challenges” takes place shortly after TMNT (Vol. 1) #11. *Raph’s segment would have to take place after TMNT (Vol. 1) #21, due to the Foot Soldiers attempting to kill him. The Foot were left thinking the Turtles were defeated and driven away after TMNT (Vol. 1) #10 and the TMNT didn’t return to New York to reveal themselves until TMNT (Vol. 1) #19 (a story arc which continued through #21). 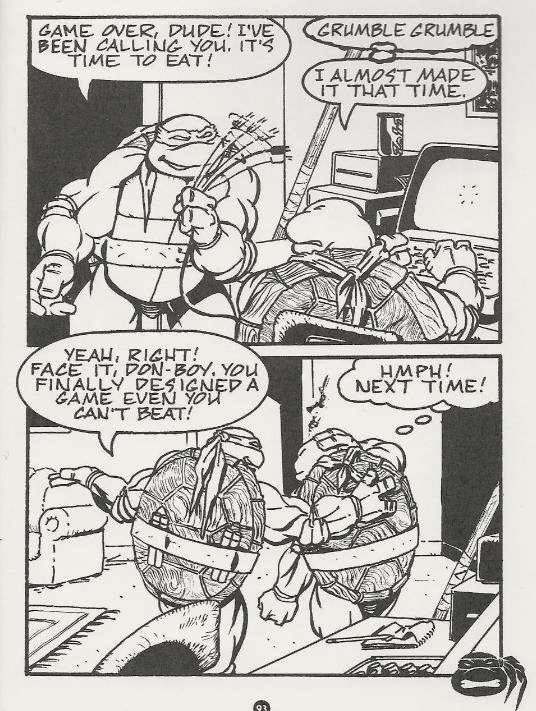 This story fits in well with other stories taking place between “Return to New York” and “City at War”, such as “Digital Webbing Presents TMNT” and “Kung Fu Theater”, which show a sloppy and disorganized Foot attempting with futility to wreak revenge on the Turtles for killing the Shredder. *Leo recalls events from TMNT (Vol. 1) #1 (their origin), TMNT (Vol. 1) #2 (their battle with the Mousers), TMNT (Vol. 1) #5 (their meeting the Fugitoid), Tales of the TMNT (Vol. 1) #7 (their prehistoric adventure with Renet) and TMNT (Vol. 1) #10 (their exile from New York at the hands of the Shredder). *On Page 10, a “Gizmo” comic can be seen on Mike’s desk. “Gizmo” was a comic written and drawn by Michael Dooney. *Mike’s full name is spelled two different ways in this book. His pin-up on Page 10 spells it the “wrong” way, “Michaelangelo,” which was actually Eastman and Laird’s original spelling for his name until they realized they’d made a booboo and “fixed” it. His chapter is properly spelled “Michelangelo”. *The Raphael segment of this story was adapted as a subplot in the 4Kids TMNT cartoon episode, “Touch and Go”. 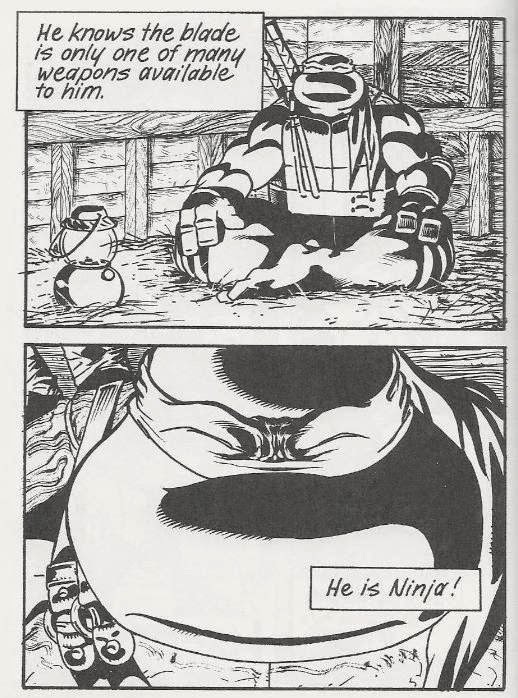 Michael Dooney’s “Challenges” is a very unique piece of literature in the TMNT library and the sort of creator-driven project I’d love to have seen more of from Mirage. While the Mirage staffers were always welcomed to contribute their own art and stories to the multitude of TMNT books coming out across both Mirage and Archie (that was their job, after all), “Challenges” was something different. It’s a graphic novel that isn’t constrained by fitting into some grander ongoing storyline of a main series, nor is it some whacky “out of universe” one-shot, either. It’s merely an opportunity for one of the most celebrated artists in TMNT history to tell an extended tale of the characters, drawing on their many experiences but without the shackles of trying to edge itself into a separate continuing narrative. What Dooney does with this 93-page graphic novel is basically give the audience a refresher course on the five primary characters of the TMNT series as well as a cliff’s notes version of their origin and “story up until now”. Rather than simply tell the audience who the characters are and what they’re like, Dooney gives us an anthology package of tales spotlighting each Turtle in often mundane (by their standards) situations that let their personalities and skills flow naturally in response to the “challenge”. What “Challenges” makes me think of every time I read it is the old mainstream comic market hook of “jumping on points”. You know, like how a book like Batman or X-Men will eventually become so bogged down in its own 50-70 year continuity, juggling five or six separate “family” titles that all interconnect, suffocating beneath one year-long “event” after another, managing a smorgasbord of tie-in issues with other unrelated books until at last the readership and the creative team just throw their hands into the air and scream “ENOUGH!” What comes next is always a “jumping on point” where the creators apologize for their years of impenetrable storytelling and promise that anyone can pick up this issue and not need to know a thing about the book. Sometimes it’s true, more often they’re liars. The point is that “Challenges” reads like a “jumping on point” done right, even though it isn’t a “jumping on point” at all. You learn everything you need to know about the characters and their history and you’re good to go. Story-wise, “Challenges” makes for a very quick read. It totals 93 pages, but even disregarding the chapter title pages and the string of character pin-ups, the stories are very decompressed and flow quickly. As I said earlier, “Challenges” isn’t about “telling you” what the characters are like, but is more interested in “showing you”. Dooney, one of the most popular artists within Mirage’s stable of talent, succeeds in doing just that, as you watch the Turtles overcome their various challenges (both big and small) and come to understand them as you do. Only Leonardo’s chapter feels like it has to “tell” more than “show”, but that proves to have been done intentionally, as it feeds a rather funny gag that gives you a glimpse of the guy’s rarely seen softer side. Of all the chapters, which is my favorite? Well, that’s not really a fair question since one of those chapters has a battle with the Foot in it and I’m always a sucker for those. But the Raphael chapter has even more going for it than that, as the violent rooftop battle seamlessly segues into a sweet tale where we get to see Raph drop his hard-drinking, bar-brawling tough guy armor momentarily and behave closer to “himself” (his “real” self) then we’ve ever seen. 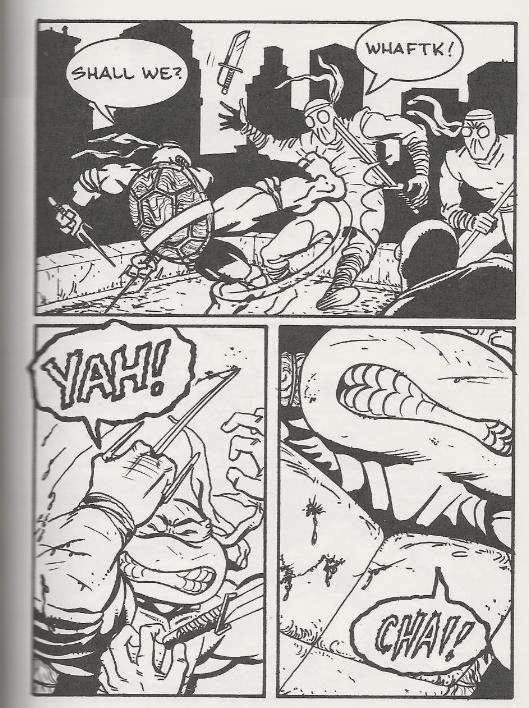 Raph is a character that often comes across like he’s “trying too hard” to be a badass (particularly under the pen of guys like Kevin Eastman). Writers often fall into the trap of making him a “green Wolverine” and all we get is the drinking and the cursing and the wanton slaughter of every foe who gets in his way. 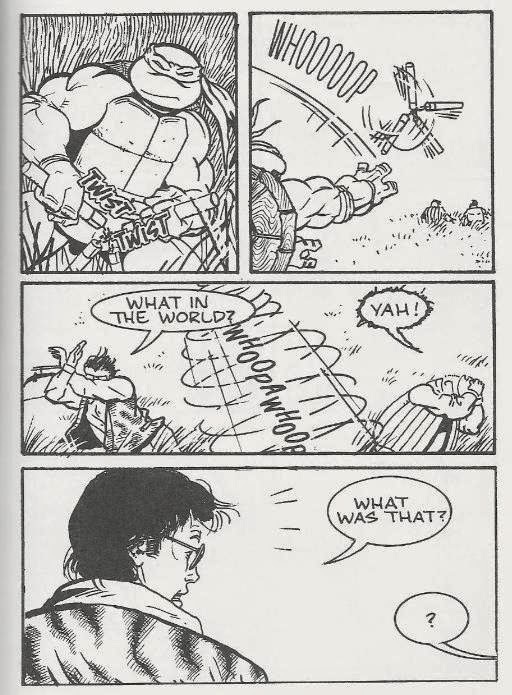 Raph starts the chapter out that way, mowing down Foot Soldiers, but proceeds to discard the aforementioned “armor” once he sets foot in Mrs. Morrison’s abode. He still acts sufficiently Raph-like, displaying bad manners all over the place, but it’s a softer and more “realistic” version of Raph who acts more like a genuine teenager (after all, how many hard-drinking, bar-brawling fifteen year-olds do YOU know?). All the chapters provide such fascinating character introspections as this, but among them all, I think Raph’s succeeds the most. 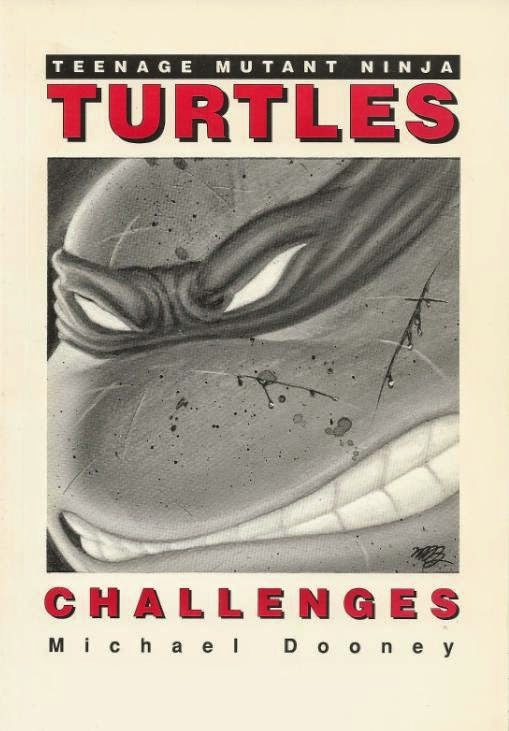 “Challenges” is essentially a primer to the TMNT universe, naturally illustrating everything you need to know in under a hundred pages without ever feeling awkward, loaded or forced. Honestly, if you know someone new to the comics and they need to “learn what the characters are all about”, do nothing more than hand them a copy of “Challenges”. Problem solved. If my memory serves me, Shadow gave her own critical thoughts on the town of Northampton, MA way back in Tales of the TMNT #7 (the goth/werewolf issue where she was forced to live at the farmhouse). I'm surprised it may not have been mentioned elsewhere. Northampton, MA is actually the hometown of Jonathan "Sinners in the Hands of an Angry God" Edwards as well as being the homebase of Mirage Studios. That gives me two reasons to want to visit the sleepy little hollow sometime! You know, it just hit me that this is probably the only instance in which the Old Toon Foot logo appears in the Mirage continuity. The 2k3 logo got worked into Tales Volume 2, but the OT logo only appears in the origin summation of this book. I thought that at first, too, but then I double-checked TMNT (Vol. 1) #1. 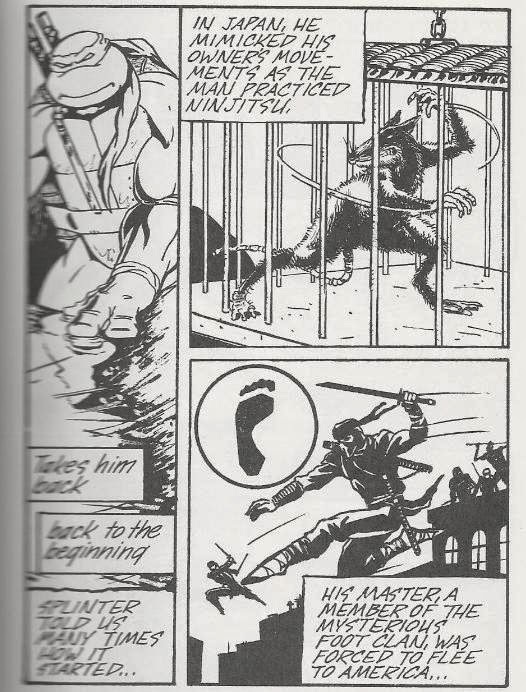 Page 14, the last panel, all the raised fists in front of the young Oroku Saki, the "footprint" logo appears behind him inbetween a pair of crossed swords. I honestly cannot think of any other time that version of the logo was used in the Mirage comics (aside from "Challenges", of course), but there it is! Wow, that is epic fail on my part that I forgot about that reference. It sure is plain as day in the very first issue. I just assumed that classic OT logo would have been too cheesy and obvious to appear in the Mirage Comics. Have you tracked down any more references to Northampton, MA in the Mirage comics?